I picked this book up while at the Faith in Literature conference, where I was fortunate enough to attend two conversations with Krista Tippett, as well as a luncheon with her. She was so inspiring that I could not pass on the opportunity to acquire an autographed copy of her book. It was promptly placed at the top of the “to-be-read” pile. The book is basically a collection of her thoughts along with snippets of conversations with spiritual thought leaders, activists, writers, and poets from her radio show, “On Being.” She divides the book into five main sections: Words, Flesh, Love, Faith, and Hope. There is so much wisdom in this book, that it is impossible for me to do it justice, so I will just share a few passages and my thoughts on them. The first one concerns the power of stories. They touch something that is human in us and is probably unchanging. Perhaps this is why the important knowledge is passed through stories. It’s what holds culture together. Culture has a story, and every person in it participates in that story. The world is made up of stories; it’s not made up of facts. I had a professor in college who specialized in Irish literature, and I remember him telling me that stories mattered. That has stayed with me throughout my life. There is power in stories and poems. They convey something about the human experience that cannot be expressed in a spreadsheet or a graph. It saddens me when I talk to people who say they never read fiction or poetry, because they don’t have the time or they only want to read “factual” books. These individuals miss out on something unique to the human experience, a communal sharing that our society desperately needs. Growing up, I connected to the revolutionary spirit of the 1960s and did my best to carry the torch of social change. But after a while, I became disillusioned, and Krista captures what it is that has changed between the 60s and today. A comparison was made with the 1960s, another moment of social turmoil, including many assassinations. A journalist said that he thought the difference between the 1960s and now was that even though there was incredible tumult and violence, it was at the very same time a period of intense hope. People could see that they were moving toward goals, and that’s missing now. It is hard to remain hopeful when we are bombarded with negative stories via social media and network news stations. I really make an effort to stay positive, but sometimes I can’t help feeding in to the hype. One of my short-term goals is to try to be more positive and hopeful. I have always been fascinated by both science and mysticism, which is why the following quote resonates with me. Both the scientist and the mystic live boldly with the discoveries they have made, all the while anticipating better discoveries to come. What I love about science and mysticism is that they both seek to illuminate the hidden mysteries of existence. There was a time when the mystical arts and the sciences were aligned. That changed for a while and the two were at odds. But lately, I see the paths converging again, and I think that it will ultimately be the unification of the scientific with the spiritual that will usher in the next stage of human evolution and ultimately save us from ourselves. With all the negativity, divisiveness, and hostility that I have seen this past year, this book was exactly what I needed to shift my perspective back to the positive. Too often my cynicism kicks in, but Krista reminds me that there is always hope and that we should never stop striving to improve ourselves and the world around us. I want to close with one more quote that really captures the importance of this book, which I hope you will read soon. Our problems are not more harrowing than the ravaging depressions and wars of a century ago. But our economic, demographic, and ecological challenges are in fact existential. I think we sense this in our bones, though it’s not a story with commonly agreed-upon contours. Our global crises, the magnitude of the stakes for which we are playing, could signal the end of civilization as we’ve known it. Or they might be precisely the impetus human beings perversely need to do the real work at hand: to directly and wisely address the human condition and begin to grow it up. I awoke this morning to the sights and sounds of a thunderstorm here in the Appalachian Mountains. It dawned on me that it was Christmas Eve and that I generally like to read and write about something appropriate for the holiday. But with the stresses of my relatively new job and being engrossed in reading the very long and dense Infinite Jest, I failed to look for something to read that was seasonal. So I gave it a little thought and decided that I would read the lyrics to one of my favorite Christmas songs and analyze it as a poem. What I find most amazing about this poem (yes, I will refer to it as a poem instead of a song) is the expression of contradictory emotions. On one hand, there is disillusion and a touch of sadness, yet this is contrasted by feelings of hope and optimism at the possibility for happiness and spiritual joy. And it is done in such a way that I cannot say which side of the emotional spectrum is most strongly expressed. The result is that you connect to this poem based upon your own emotional state when you engage with it. So if you are feeling sad, you connect with the sadness but then get touched with a sense of hope. Conversely, if you are brimming with joy and happiness, you get that from the poem too, but tempered with the knowledge that there is still sadness in the world and that all things, even the joyous, will pass. We have all heard the old cliché, that we create our own Heaven and Hell. I believe this, and I love the way it is expressed at the end of this poem. The choices we make and the thoughts that we choose to latch on to directly impact our feelings and the reality around us. If we choose the path of spirituality and happiness, then we deserve the blessings that accompany those conscious decisions and should celebrate those blessings. But if we choose to focus on the negative and the path of hate and fear, then we also deserve the life that we are burdened with and must accept responsibility for the reality which we helped create. I wish all of you many blessings for the holidays and New Year, regardless of which holiday you observe or whether you observe a holiday at all. For myself, I am going to focus on my family and spreading more happiness, love, compassion, and understanding, because I think the world could use a little more of that right about now. I really love this series. Leia is such a great leader and we need more women leaders in graphic novels, literature, and in the real world. 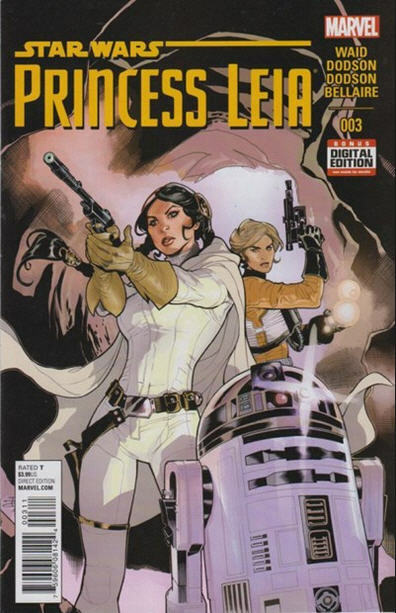 In this issue, Leia and Evaan locate another group of Alderaanian survivors, but they are suspicious of Leia. And when the imperial forces descend on them as a result of a traitor, then the group turns against Leia. One section of this issue that stood out for me was a brief discussion on hope. Evaan: Never seen you give up hope, ma’am. Leia: Hope led me to the rebellion, and Alderaan paid for that. Now my hope has led the empire here. I don’t think the galaxy can survive much more hope from me. I have grappled with the question of whether hope is a good thing or a bad thing. Hope can cause people to remain in bad situations, thinking that they will change. Hope can create expectations which can lead to disappointment and disillusion. Hope is one of the plagues in Pandora’s Box. But loss of hope can also lead to apathy, to despair, and to the diminishing of the determination needed to face challenges. Hope has certainly carried me through some dark times in my life. I think hope is one of those things that transcend good and evil, since both good and evil can result from it. At least, that is how I feel about hope right now. I suspect my feelings will change again. One last word regarding hope as it relates to this tale. I do not think it is a coincidence that hope focuses prominently here, since the original Star Wars film was subtitled “A New Hope.” What are your thoughts on hope? Feel free to share them below. Thanks for stopping by! This is one of the better issues in this series. It ties up a lot of loose ends that have been bothering me for the last several installments, and it deals with three topics that fascinate me: hope, fear, and God. In issue 7, Alice’s mother reappears, seemingly to have returned from the dead. The Doctor expresses his views on the impossibility of this occurring, which angers Alice. She confronts the Doctor, questioning how in a universe of infinite possibility that one can claim there is no hope of something deemed impossible happening. Are you seriously going to stand there and tell me there’s no way? 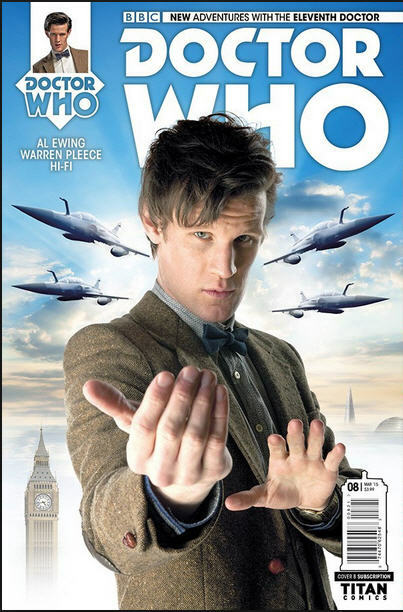 Not in all of time and space? We see miracles every single day, but not today? Is that what you’re saying? This time there is no hope? While Alice is arguing the validity of her mother’s return, Jones and ARC are suffering from a fit of paralyzing fear. The Doctor makes an astute observation on the frequent human response to fear. Fear, is it? That what came over you before? Does tend to make people violent. Finally, what I found most intriguing about this issue is the debate about God’s existence and the definition of God. It is discovered that the two warring alien races began their war over a dispute about God. They each sent an explorer through a wormhole and they radioed back that they saw “the face of the creator,” and then never returned. Each race developed their own theory about the creator, and their disparate views resulted in the prolonged war. As I read this, I could not help thinking how it is an accurate portrayal of our world. Fear causes us to act violently towards other. Ethnocentric views of what defines God have fueled wars for generations. In spite of this, hope for peaceful coexistence and enlightenment still continues. I must admit, I was impressed on how the creative team was able to express all this in a small comic.